This is the quote found on the website of the skincare brand, Òrí Botanics. DFN is obsessed with Òrí Botanics because quality is so important to this skincare brand. For example, Òrí Botanics will produce all of their products in small batches in order for them to be delivered as fresh as possible to the customers! We are thankful that we were able to speak with the founder of Òrí Botanics, Sinmisola Esene. Enjoy! DFN: How would you describe your skin care routine? Esene: My skincare routine is deliberate but simple. I love to take care of my body and I believe that every woman and man should love to take care of themselves as well. Between my daily routines and spa treatments, I am able to maintain my best look. I love to treat myself to a massage and bath and Moroccan Hammam in Calgary South gives the best bath! DFN: What was your background before you opened Òrí Botanics? Esene: I grew up in Nigeria and I left Nigeria for Canada to study, expand my knowledge in business, be around other creative and diverse individuals, and develop as much as I could. Like so many young adults in their twenties, it was a very intense period in my life. I was in a transition phase and coming from a family of intellectuals, I felt that I needed to figure out who I was and where I was going. The defining moment came on one of my trips to Nigeria. On this trip, I noticed the disparity between dark-skinned and light-skinned people. There were mostly billboards of light-skinned people promoting cosmetics and beauty and I wanted this to change. I also wanted people to feel more confident in their skin. 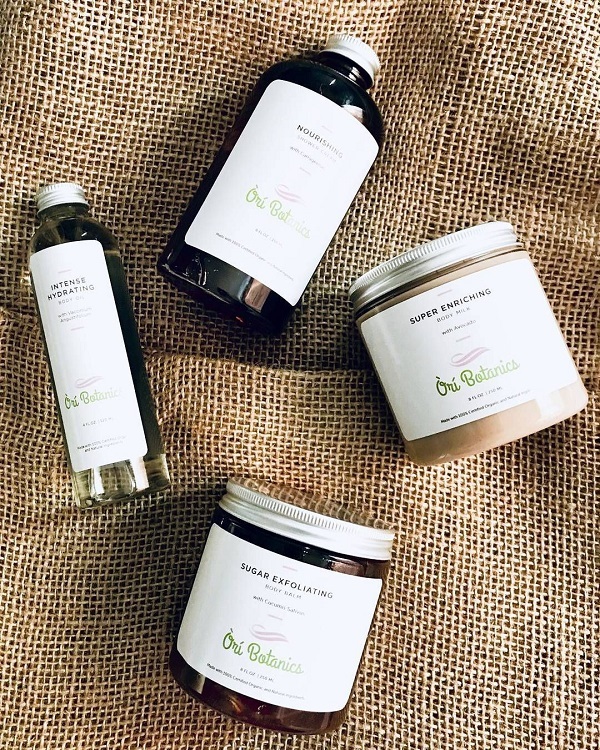 DFN: What made you want to launch Òrí Botanics? Esene: I established my brand after seeing a gap in the market for natural and organic skincare products. A lot of women in Nigeria use skin lightening products and these products can cause a lot of damage to the skin. It can be very challenging to convince people that bleaching their skin will compromise their health but I see this challenge as an opportunity to create awareness. DFN: What was the hardest part about launching Òrí Botanics? Esene: Building a diverse and sustainable skincare brand can present huge challenges. The main challenge is addressing the costs that are associated with importing and exporting in and out of Canada. DFN: Where do you see yourself and Òrí Botanics in the next five years? Esene: I have big dreams and I would like for the brand to grow in a meaningful and sustainable way. First of all, I would also like to reach more consumers here in Canada and globally. In addition, I would like Òrí Botanics to become a powerful and innovative household brand. DFN: What do you love the most about Òrí Botanics? Esene: I absolutely love the freedom of being creative and working in a constantly evolving field. Every project is full of potential and building a brand for myself is very exciting and I learn something new and special every day. DFN: How did you get started launching Òrí Botanics? Esene: I started Òrí Botanics with my husband. When we first launched the company, we offered a routine that consisted of six steps. However, we quickly realized that the routine was too complex and we decided to promote simplicity in skin care. DFN: What are the benefits of rosehip oil? Esene: Rosehip oil was used by the ancient Egyptians because of its healing properties. Our oil has a light-yellow color. It is also known as a dry oil which means that it is non-greasy, super light and easily absorbed. Our pure rosehip oil is handpicked, one-hundred percent organic and cold pressed. It consists of eighty percent fatty acids, omega 3, omega 6 and omega 9 which assists in repair and skin cell regeneration. Also, it contains vitamin C which has brightening properties and helps to correct any pigmentation issues that one may have. Our oil also contains vitamin E which calms and hydrates dry and sensitive skin. We would like to thank Sinmisola Esene for taking the time to interview with Detroit Fashion News! Be sure to follow @oribotanics on Instagram, @OriBotanics on Twitter, and @OriBotanics on Facebook.